The landlords, who also own the house next door, hired landscapers to transplant the forsythia near their porch into our front yard by the road. 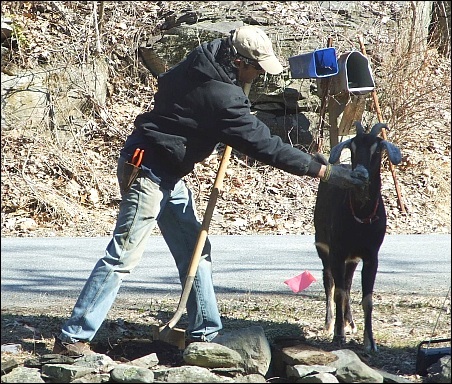 They started digging today. It’s not horribly cold out right now, but at least it has a lovely fur coat on. So cute! I caught a flash of movement out of the corner of my eye, and grabbed my camera before I even checked outside to see what it was, just in case. 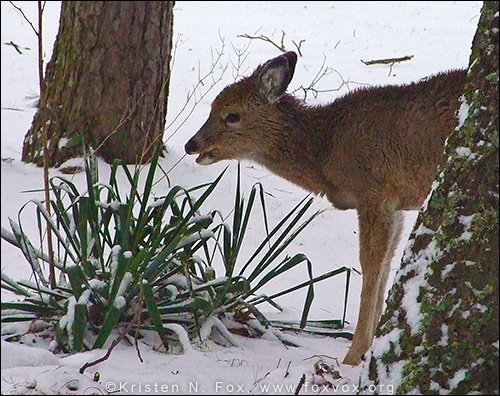 It was a baby deer (ok, yes, a “fawn”), right by our back deck! 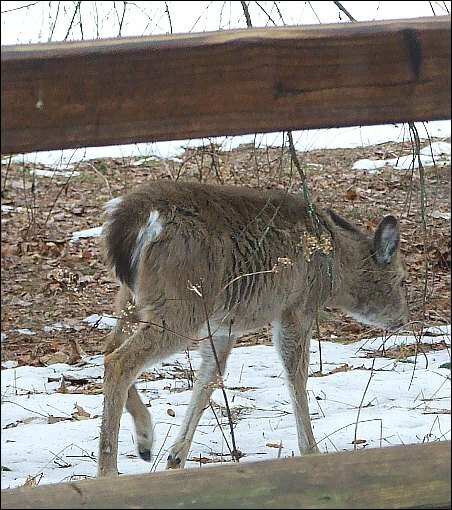 Maybe it’s a tad older than a baby, since it was grazing and I didn’t see any other deer in the immediate vicinity, but it’s definitely really young – look how small and fuzzy it is! 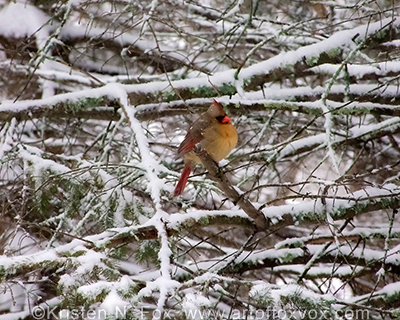 I caught this lovely female cardinal sitting on a snowy branch the other day! The soft browns and oranges really come alive in this shot, which is a nice change from the classic red male cardinal that usually gets all of the attention. 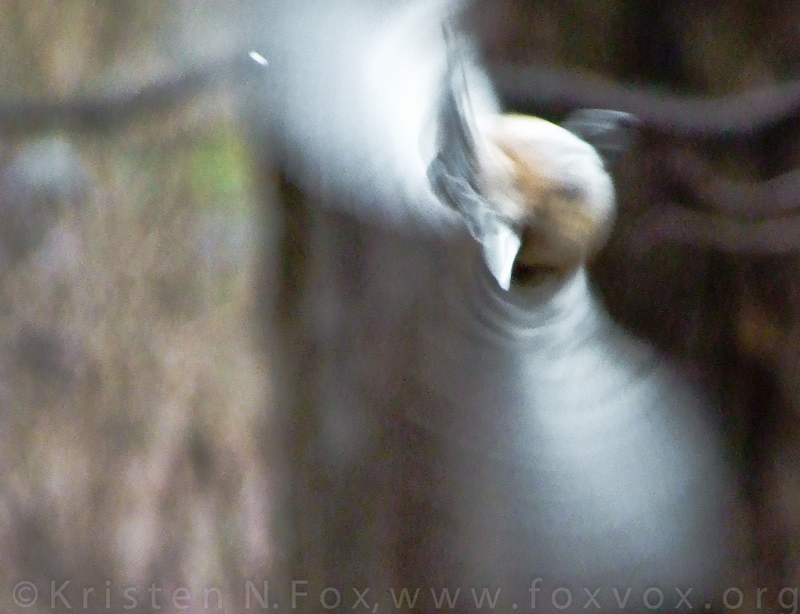 Click on the image for a framed, unframed or canvas print of this lovely wintery bird! The other day I heard a bunch of branches cracking and dropping to the ground in one of the big trees out back. 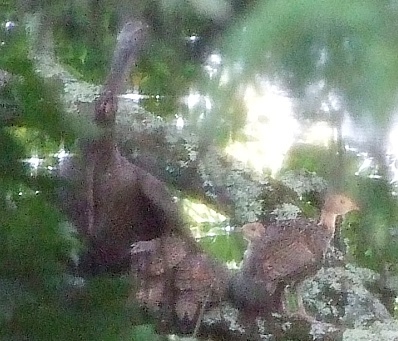 When I looked closely, I saw movement, and discovered a full grown turkey about 30 feet up (in the trees, not a 30 foot turkey), as well as a number of little turklets! This is the only photo I could get of them, as the excessively humid air was screwing with the camera autofocus and they were pretty far away, but at least I got one before they flew off to farther trees! I’ve got a new series of Celtic designs to share – my adaptation of ancient, two thousand year old Celtic coins found all over Europe! There are 8 coin designs in the series, and the first one is a very popular theme in Celtic coins – horses. Celts LOVED their horses! 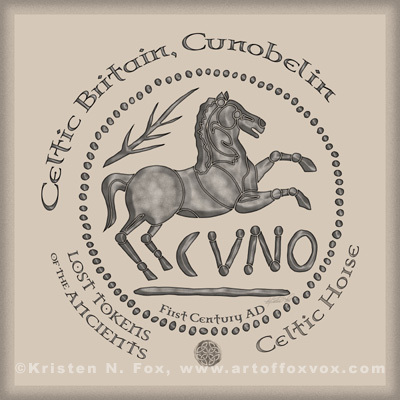 This first design in the series is also the ‘newest’, dated First Century AD (all others are BC), the most realistically portrayed, and is based on a Celtic Horse Coin that was minted in Celtic Britain by the ruler Cunobelin (shortened as ‘CVNO’ on the coin – you can see details better in the fine art print image at the bottom of this post), which means Hound of Belinus, the Celtic Sun God. Stay tuned for the next coin post!